The Midvale Cottage Post: Home Sewing Tips from the 1920s - A Short Cape to Match Your Frock! 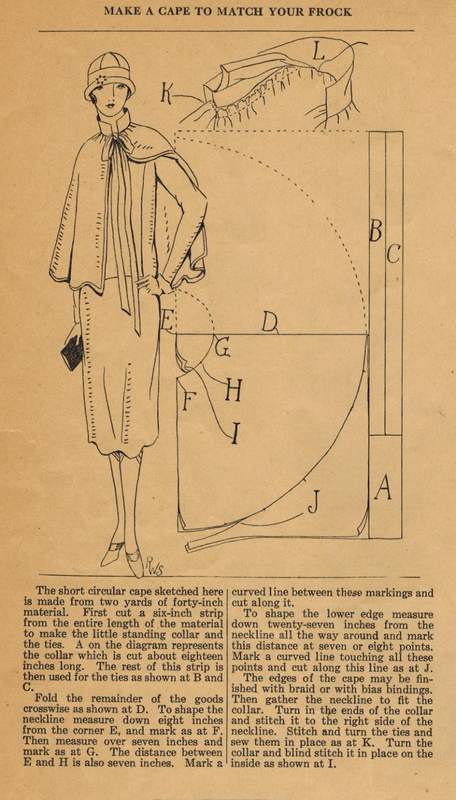 Home Sewing Tips from the 1920s - A Short Cape to Match Your Frock! This beautiful short cape looks easy to make using Ruth's clear instructions. And if you hesitate at cutting the half circle, just refer to Ruth Wyeth Spears' tip for cutting a circle from a square (and illustrated by me!) scaling it up as needed. I love the tall stand collar and ribbon tie closing. Would you trim it with braid or bias binding? I guess it would depend on your choice of fabric. Happy sewing!